As is often the case when the stakes are high, the media distracts the public from the real issues. The handling of the Israeli attack against the Freedom Flotilla is another illustration of this. The mainstream media have been trying to distinguish between the good and the bad guys, instead of analysing what is being played out. In this article, Thierry Meyssan dissects both Tel Aviv’s and Ankara’s real motivations, and discloses the «detail» that transformed Israel’s armed operation into a diplomatic debacle. One week after the attack by Israeli forces on the high seas against a humanitarian convoy, what are the new elements that have emerged and what initial conclusions can be drawn? Before answering these questions, we should start by sweeping aside the media babble clouding the issue. In the first place, the aim of the Freedom Flotilla was not simply to transport material assistance to the people of Gaza, but also to break the blockade . This fact, which was kept secret for two days, suddenly crept into the arguments of Israeli spokespersons. Hence they accused the humanitarian workers of being crypto-political activists, notwithstanding their consistent claim that their action was meant to compensate for the failure of States to enforce international and humanitarian law. The activists aboard the Flotilla were ordinary citizens from various parts of the world determined to enact the provisions of UN resolution 1860. The Israeli spokespersons blamed the Flotilla passengers for opposing resistance, accusing them of having used weapons against the soldiers. This was purported to show that the people were actually « terrorists ». To corroborate this argument, the Foreign Ministry disseminated various photos of knives and attack weapons confiscated on the Mavi Marmara . Now, it just so happens that the photos’ EXIF data indicates that most are old and were taken in a different context . This is a classic propaganda technique : while we are busy discussing the authenticity of the photos, they are conveniently mask the fact that, in the eyes of international law, not only is the continuation of the blockade illegal, but, as the occupying power, Israel has the duty to ensure the safe delivery of the humanitarian aid. In addition, the attack on the flotilla in international waters being illegal, the passengers had the legitimate right to rebel, provided they – the passengers – made use of « proportionate force », which was the case. Secondly, in terms of security, Israel had no need to stop this fleet. It was not transporting weapons for the Palestinian resistance, only aid for the population. Indeed, Tel Aviv has imposed an embargo which, in the words of the United Nations Special Rapporteur, amounts to "collective punishment", but even under the punishment inflicted on 1.5 million Gazans, 10,000 tons of goods do not represent a significant stake. It is not with less than 7 kg per capita that the people of Gaza will rebuild their houses and feed their families. Israel has already allowed ground and sea convoys to go through and, this week, it has pledged to deliver the aid arriving on the cargo vessel Rachel Corrie. Israel’s goal, as I have stated from the beginning, was to "undercut the credibility of Turkey », at a time when it has been moving closer to Syria and Iran - or, clearly put, to bring down the Erdogan government and "claim the leadership of the Zionist movement by showing that Tel Aviv decides and Washington complies . This ninth convoy composed of a group of associations was supported by Ankara to demonstrate the illegality of the blockade. At his press conference in New York, Turkish Foreign Minister Ahmet Davutoğlu, said his government had intensified its contacts with his Israeli counterpart to inform him about the convoy and to request free passage. 1. Israel gives the convoy the green light, which is greeted triumphantly by the Gazans. In this case, Turkey can demonstrate that, unlike most Arab governments, it is independent and does not abide by the orders of Tel Aviv. 2. Israel diverts the convoy and directs it the port of Ashdod/Isdud. The goods and the humanitarian workers proceed to Gaza by road, where they are given a jubilant welcome. Tel Aviv can hold its head up high, and Ankara’s political gain is minimum. 3. Israel sabotages the convoy or boards it for inspection. In this case, Ankara internationalises the incident and seizes the opportunity to challenge the continuation of the blockade. Politically speaking, this is the best scenario. Moreover, the Israeli government made sure it had Washington’s backing . As was pointed out by Libyan leader Muammar al-Gaddafi , it is unthinkable that the Israeli forces could have launched a piracy operation in the Mediterranean Sea without first informing the VIth United States fleet, responsible for combating piracy and terrorism in this area and with whom they routinely collaborate. Israel’s idea was to seize the goods and forward them in Gaza to show its good faith, while arresting the activists and accuse them of having ties with the "jihadists" in order to compromise the democratic-Muslim government of the AKP (Justice and Development Party). 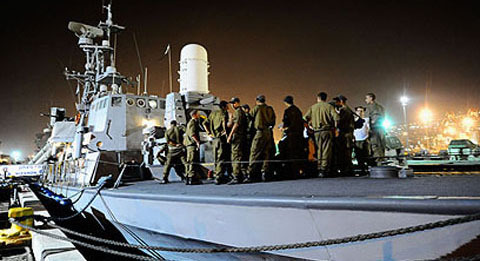 The storming of the flotilla could have taken place either at night in the high seas or by day in Palestinian waters. The Israeli government chose the first option so that the assault would not be commented live on satellite television networks by the sixty-odd journalists invited by the associations. The order was given once the attack against the Iskenderun naval base was over. Israel was, in fact, well covered by the United States, which (together with France) strived to avert any binding decision by the Security Council. After an interminable session, what finally came out was a miserly presidential statement . It contains a litany of pious wishes on the liberation of prisoners, on humanitarian aid for the Gazans, and the creation of a Palestinian State. In the wings, the Council was divided on a specific legal point, which we explain in greater detail below. It revealed its impotence to take direct responsibility for the elucidation of the facts: instead of creating an inquiry commission, it limited itself to calling for "a prompt, impartial, credible and transparent investigation [possibly by Israel] conforming to international standards ». While, on its part, the UN Commission on Human Rights has created a fact-finding mission, the fact remains that its area of authority is limited  As it happens, Israel couldn’t care less, as was the case for Desmond Tutu’s mission on the crimes perpetrated at Jenin, or that of Richard Goldstone on the Gaza bombardments. Although news agencies were reporting that 16 had been killed, the actual death toll would appear to be 9, provided of course the seriously wounded do not succumb to their injuries. According to Turkish television, the Israeli squad had a list of people to be eliminated, but their plan was thwarted by the resistance of the passengers; only Raed Salah, one of the leaders of the Islamic Movement in Israel, was hit. It is probable that at the time it ordered the assault, the Netanyahu government already knew that the Mavi Marmara had been registered in the Comoros Islands. The commandos therefore believed they were acting on Comoran territory. However, the organizers, who were politically supported by the Turkish authorities, had hoisted the Turkish flag, not the one from Comoros. In addition, they had displayed a huge Turkish flag on the side of the cargo. According to the jurisprudence at the International Court of Justice in The Hague , the boat was not Comorian territory, but Turkish. Besides, it had already changed its nationality when it joined the rest of the fleet and was denied mooring by the Republic of Cyprus precisely for that reason. International debate on the failure of Israeli intelligence has been focusing exclusively on this one issue: how could the Mossad not have known about the boat’s change of nationality? All the awkward statements coming from the Foreign Ministries, in Washington, Paris and elsewhere, requesting that the facts be established before they can decide on the legal consequences, reflect the same concern : at the time of the assault, was the Mavi Marmara Comoran or Turkish territory ? Just before the Atlantic Council meeting, Turkish Justice proceeded to a new crackdown to arrest people suspected of plotting against the constitutional government. Among the suspects is former Minister of Justice Seyfi Oktay. They allegedly belonged to the Ergenekon network, the current local version of Gladio, that is to say the secret services of NATO. The symbolism of these arrests has been heightened by the campaign conducted for the last two years by the supporters of the AKP in the media. Through televised fiction and films, they have been popularizing the way in which NATO intelligence services organised four consecutive coups d’Etat in their country. They haven’t stopped explaining that the Anglo-Saxons play a double game; officially allied to Ankara, they have been stoking the Kurdish, Armenian and Cyprus problems with a view to destabilizing Turkey. At the end of a long and trying meeting behind closed doors, NATO Secretary-General Anders Fogh Rasmussen pronounced a one-sentence declaration : "I request the immediate release of the detained civilians and ships held by Israel" . Of course, no one ever considered seriously that NATO would coerce Israel, but therein lies the pressure lever : in order to preserve the Alliance, it was paramount for the United States to arrive at an amicable resolution of the conflict. Exactly 24 hours after Rasmussen’s statement, the spokesman of the Israeli jailhouse administration announced the release of all foreign prisoners (Israeli nationals remained in detention) and their return to their countries of origin or to other host countries. This new developmet brought an unexpected problem. The Atlantic Alliance was created by the United States and the United Kingdom together with the states belonging to their post-Yalta sphere of influence. They were the masters and the other members were under their command. Apart from the DeGaulle interlude, no member has ever dared to question this set up. Until now: as a sign of its ascending power, Turkey has just used the North Atlantic Treaty to force the hand of the United States. While handcuffing and beating up their prisoners, the Israeli commando squads were shouting " One minute! ", "One times! ", in mocking reference to the altercation between Prime Minister Recep Tayyip Erdogan and Israeli president Shimon Peres, during the 2009 Davos Economic Forum. This verbal affront has incensed Turkish public opinion who considers itself insulted through its Prime Minister. Not only does it approve of Mr. Erdogan’s reaction, it wants him to play a more assertive role on the international scene, as indicated by the lastest polls. An investigation has been opened by the Prosecutor’s office in Istanbul-Bakirköy  which has already arranged for a forensic autopsy of the victims plus a hearing of the Turkish witnesses. It could swiftly indict Benjanmin Netanyahu and Generals Ehud Barack and Gabi Ashkenasi for piracy, aggravated assault, murder, kidnapping and arbitrary detention. However, according to the available evidence, the prosecutor could reclassify the charges as crimes against humanity. In that event, the accused could no longer travel abroad without risking being taken in for questioning. If one goes by the White House press releases and briefings relating to the successive phone conversations between president Obama and Prime Minister Natanyahu, the Israelis were initially proud of their operation. The first call was placed by Mr Netanyahu, apologizing to President Obama for being unable to honour his invitation given the events that forced him to return immediately in Tel Aviv. In the course of the second conversation, Mr. Netanyahu gave his version of the events, putting President Obama before a fait accompli. While the United States authorized the inspection of the boats, it did not anticipate the slaughter. The third conversation centered on how the Security Council meeting should be torpedoed, in other words the Israeli imposed their road map to the United States. The tone changes when it comes to referring the matter to the Atlantic Council. Mr Netanyahu becomes difficult to reach, while Secretary of State Hillary Clinton has to confront her Turkish counterpart who came to harass her. She looks for a scapegoat and asks General Ehud Barack to find a solution by pinning the responsibility on a subordinate, but Barack refuses to go along. Not only did he not dissociate himself from the commando squad involved in the raid, but he stood up for the soldiers and even paid them a personal visit. Ultimately, the Israelis were obliged to release the prisoners. They imposed the situation but finally the solution was imposed on them. An additional problem arises from the killing of Furkan Dogan, a young man of dual Turkish-U.S. nationality, whose family may sue the State of Israel for murder in a U.S. court. In the end, the Israeli government failed to reach its two objectives. Turkey has come out strengthened from the confrontation, reinforcing as well the triangle it has formed with her Syrian and Iranian allies. At the same time,Turkey has acquired several new cards. Turkish Justice will judge in absentia the Israeli Ministers and generals for the crimes committed. The fact-finding mission set up by the UN Commission on Human Rights will tarnish Israel’s image even further. Above all, Turkey is in a position to play a second game. According to our information, Ankara. According to our information, Ankara has told the State Department that Mr Erdogan was planning to personally break the blockade of Gaza, as François Mitterrand did with the siege of Sarajevo . He could embark on a fleet chartered by humanitarian associations and politically supported by governments, including Iran, Syria and Venezuela. Hassan Nasrallah, Hezbollah Secretary General, has already called on all the Lebanese to take part in future initiatives. A appeal could also be made to sailors in the Mediterranean Sea, so that hundreds of pleasure boats could join in. The whole operation would be escorted by the Turkish navy, a member of NATO. This prospect has alarmed Washington which more enthusiastically than ever is trying to convince Tel Aviv to lift the blockade. Furthermore, the prestige acquired by Turkey during this operation spotlights the collaboration of certain Arab governments with Israel, particularly that of Hosni Moubarak. The Egyptian President has indeed actively contributed to the siege of Gaza to prevent any contact between the Palestinian Hamas and the Egyptian Moslem Brothers. Cairo had no qualms about building a steel wall with money from the U.S. and French know-how to immure 1,5 million Gazans . And one stills remember Foreign Secretary Ali Aboul Gheit’s reply when asked what he would do about the starving women and children who tried to cross the border : "Let them try and we will break their legs!". As a result, the blood of the Marmara victims has spilled on the Mubarak Government and Alexandria is on the brink of an uprising. To release the tension, the Egyptial government has decided to partially open the border temporarily. Before playing in the big leagues, Turkey had most probably secured its rear. Based on diplomatic sources, our hypothesis is that Turkey received guarantees from Russia during President Dmitry Medvedev’s visit to the Middle East. This scenario is corroborated by the sudden announcement of the arrival in Ankara, on 8 June, of Prime Minister Vladimir Putin to attend a summit which was not on his agenda. There, he will meet Iranian President Mahmoud Ahmadinejad and Syrian President Bashar al-Assad (who is not yet a member of this forum, but has all of a sudden been invited as an observer). The Israeli delegation that is on the list will most probably not turn up: any high-level official would be at the mercy of the Istanbul-Bakırköy Prosecutor. The Turkish justice official may unexpectedly decide to qualify the atrocities committed as crimes against humanity and proceed to arrest suspects. « Par la piraterie, Israël se dévoile aux yeux du monde »[Through its acts of piracy, Israel has unveiled itself to the world], interview of Hazem Jamjoum by Silvia Cattori, Voltaire Nework, 4 juin 2010. « Weapons found aboard the Mavi Marmara », par Israel MFA, Flickr, 2 juin 2010. Les preuves truquées d’Israël contre "Free Gaza" : des photos prises en 2006 et 2003?» (Proof of fake photos to incriminate "Free Gaza": taken in 2003 and 2006), by Aragorn, Agoravox, 3 June 2010. Why did Israel attack civilians in the Mediterranean?, by Thierry Meyssan, Voltaire Network, 1 June 2010. Did Israel conduct two military operations against Turkey?, Voltaire Network, 3 June 2010. NATO could not have been unaware, by Manlio Dinucci, Voltaire Network, 4 June 2010. Message de Mouammar Kadhafi à Barack Obama by Muammar al-Gaddafi, Voltaire Network, 2 June 2010. UN Security Council Presidential Statement, Voltaire Network, 1 June 2010. Resolution adopted by the UN Human Rights Council, Voltaire Network, 2 June 2010. S.S. Lotus Case (Fr. v. Turk. ), 1927 P.C.IJ. (ser. A) No. 9, at 25. NATO requests release of "Freedom Flotilla", Voltaire Network, 1 June 2010. Turkish Parliament Resolution, Voltaire Network, 2 June 2010. 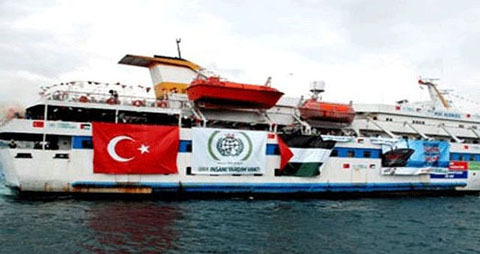 The Attack on the Gaza Freedom Flotilla and International Law, Voltaire Network, 6 June 2010. 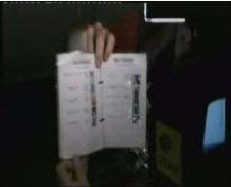 Criminal investigation opens in Istanbul against Israeli pirates, Voltaire Network, 5 June 2010. Gaza: France oversees the extension of the Separation Wall, Voltaire Network, 26 December 2009. Une semaine après l’attaque en haute mer d’un convoi humanitaire maritime par les troupes israéliennes de quels éléments nouveaux dispose t-on et quelles premières conclusions peut-on établir ? Avant de répondre à cette double question, il convient de balayer le blabla médiatique qui obscurcit le sujet. En premier lieu, la Flottille de la liberté n’entendait pas simplement apporter du secours matériel aux Gazaouites, mais aussi briser le blocus . Cette donnée, après avoir été occultée durant deux jours, a soudain été ajoutée à l’argumentaire des porte-parole israéliens. Ceux-ci ont alors accusé les humanitaires d’être des crypto-politiques, bien que les associations aient toujours revendiqué palier à l’impuissance des Etats à faire respecter le droit international et humanitaire. Les militants embarqués sur la Flottille étaient des citoyens du monde venus appliquer la résolution 1860 des Nations Unies. Les porte-parole israéliens ont reproché aux humanitaires d’avoir opposé une résistance aux soldats et d’avoir même utilisé des armes contre eux. Cela montrerait qu’il s’agissait en réalité de « terroristes ». Pour appuyer ce raisonnement, le ministère des Affaires étrangères a diffusé diverses photos de couteaux et d’armes par destination saisis sur le Mavi Marmara . Or, les données EXIF de ces photos montrent que la plupart sont anciennes et ont été prises en d’autres circonstances . Il s’agit là d’une technique classique de propagande, pendant que l’on discute de la véracité des photos, on masque que, au regard du droit international, non seulement la poursuite du blocus est illégale, mais Israël, puissance occupante a le devoir de veiller à l’acheminement de l’aide humanitaire. En outre, l’attaque de la flottille en eaux internationales étant illégale, les passagers avaient le droit de se rebeller, pourvu qu’ils aient —eux— un usage « proportionné de la force », ce qui fut le cas. En second lieu, en termes de sécurité, Israël n’avait que faire de laisser passer cette flottille. Elle n’apportait pas d’armes à la Résistance palestinienne, uniquement de l’aide à la population. Certes, Tel-Aviv a imposé un embargo qui constitue, selon les termes du rapporteur des Nations Unies, « une punition collective », mais même au regard de cette punition imposée à 1,5 million de Gazaouites, 10 000 tonnes de marchandises ne représentent pas un enjeu significatif (cela fait moins de 7 kilos par habitant, ce n’est pas avec cela que l’on reconstruit sa maison et que l’on nourrit sa famille). Israël a d’ailleurs déjà laissé passer des convois terrestres et un convoi maritime, et il s’est engagé cette semaine à acheminer l’aide transportée par le cargo Rachel Corrie. L’objectif israélien, ainsi que je l’ai indiqué dans ces colonnes dès le premier jour, était de « casser la crédibilité de la Turquie », au moment où elle se rapproche de la Syrie et de l’Iran –ou, de manière plus précise, de faire tomber le gouvernement Erdoğan— et de « revendiquer le leadership du mouvement sioniste en montrant que Tel-Aviv décide et Washington entérine » . Ce neuvième convoi du collectif associatif a été encouragé par Ankara pour démontrer l’illégalité du blocus. Lors de sa conférence de presse à New York, le ministre turc des Affaires étrangères, Ahmet Davutoğlu, a indiqué que son gouvernement avait multiplié les contacts préalables avec son homologue israélien pour l’informer du convoi et lui demander de laisser le passage ouvert. 1. Israël laisse passer le convoi qui est accueilli en fanfare par les Gazaouites. Dans ce cas, la Turquie démontre que, contrairement à la plupart des gouvernements arabes, elle est indépendante et ne se plie pas aux injonctions de Tel-Aviv. 2. Israël déroute le convoi et le fait accoster à Ashdod/Isdud. Les marchandises et les humanitaires rejoignent Gaza par la route où ils sont accueillis en fanfare. Tel-Aviv garde la tête haute, et le bénéfice politique est moindre pour Ankara. 3. Israël sabote la flottille ou l’arraisonne. Dans ce cas, Ankara internationalise l’incident et en profite pour remettre en cause la continuation du blocus. C’est le meilleur scénario, politiquement parlant. Le gouvernement israélien a cru disposer d’une autre option : montrer à l’état-major turc que si le gouvernement civil vient aider les Palestiniens, Tel-Aviv peut en retour agiter les séparatistes kurdes ; et montrer une fois de plus, qu’adossé aux Etats-Unis, Israël est au dessus du droit international. Bref, le gouvernement Netanyahu pensait possible de pousser les militaires turcs à perpétrer un cinquième coup d’Etat. Dans cette optique, le tandem Netanyahu-Barak a commandité à des mercenaires kurdes une attaque terroriste contre la base militaire navale d’İskenderun (au sud de la Turquie). Elle a été réalisée le 31 mai peu après 0 heures. Des roquettes ont été tirées lors de la relève la garde, tuant 7 soldats . Par ailleurs, le gouvernement israélien s’est assuré d’être couvert par Washington . Ainsi que l’a fait remarquer le leader libyen Mouamar Khadafi , il est impensable que les forces israéliennes aient lancé une opération de piraterie en Méditerranée sans en informer à l’avance la VIe flotte états-unienne, chargée de combattre la piraterie et le terrorisme dans cette zone, avec laquelle elles travaillent habituellement. L’idée était de saisir les marchandises et de les acheminer à Gaza pour montrer sa bonne foi, tout en arrêtant les militants et en les accusant de liens avec le « djihadisme » pour discréditer le gouvernement démocrate-musulman de l’AKP. L’abordage de la flottille pouvait avoir lieu soit de nuit en haute mer, soit de jour dans les eaux palestiniennes. Le gouvernement israélien a choisi la première option de sorte que l’assaut ne soit pas commenté en direct sur les chaînes de télévision satellitaires par la soixantaine de journalistes embarqués par les associations. L’ordre a été donné au moment où se terminait l’attaque de la base navale d’İskenderun. De fait, Israël a bien été couvert par les Etats-Unis, qui (avec la France) se sont efforcés d’empêcher toute décision contraignante du Conseil de sécurité. A l’issue d’une interminable session, celui-ci a accouché d’une indigente déclaration présidentielle . On peut y lire une litanie de vœux pieux sur la libération des prisonniers, l’aide humanitaire aux Gazaouites, et la création d’un Etat palestinien. En coulisses, le Conseil était divisé sur un point juridique particulier, que nous détaillerons dans un instant. Il s’est montré impuissant à clarifier lui-même les faits : au lieu de créer une Commission d’enquête, il s’est limité à demander « qu’il soit procédé [éventuellement par Israël] à une enquête prompte, impartiale, crédible et transparente, dans le respect des normes internationales ». Certes, la Commission des droits de l’homme de l’ONU a, quant à elle, institué une mission pour établir les faits, mais sa compétence est limitée . Au demeurant, Israël s’en moque comme il s’est moqué de la mission Desmond Tutu sur les crimes commis à Jenine, ou de la mission Richard Goldstone sur les bombardements de Gaza. Alors que les agences de presse avaient évoqué 16 morts, le bilan réel serait de 9 tués, sous réserve que les blessés graves ne succombent pas ultérieurement de leurs blessures. Selon la télévision publique turque, les commandos israéliens avaient une liste de personnes à éliminer, mais la résistance des passagers ayant perturbé le plan, seul le poète Raed Salah a été atteint. Il est probable qu’au moment de donner l’ordre de l’assaut, le gouvernement Netanyahu savait que le Mavi Marmara avait été enregistré aux Comores. Les commandos croyaient donc commettre des violences en territoire comorien. Or, les organisateurs, politiquement soutenus par les autorités turques, avaient hissé le pavillon turc et non celui des Comores. En outre, ils avaient déployé un gigantesque drapeau turc sur le flanc du cargo. Selon la jurisprudence de la Cour permanente de Justice de La Haye , le bateau n’était donc pas territoire comorien, mais turc. Il avait d’ailleurs déjà changé de nationalité lorsqu’il avait rejoint le reste de la flottille et la République de Chypre lui avait refusé le mouillage à cause de cela. Tous les débats sur l’échec du renseignement israélien ne portent que sur cela : comment le Mossad a-il pu ignorer le changement de nationalité du cargo ? Toutes les déclarations gênées de chancelleries, à Washington, à Paris et ailleurs, demandant que les faits soient établis avant qu’elles ne se prononcent sur les conséquences juridiques, portent sur ce point jamais énoncé : au moment de l’assaut, le Mavi Marmara était-il territoire comorien ou turc ? Juste avant que ne se réunisse le Conseil atlantique, la Justice turque a procédé à un nouveau coup de filet pour arrêter des personnalités accusées d’avoir fomenté un complot contre le gouvernement constitutionnel. Parmi les suspects figure l’ancien ministre de la Justice, Seyfi Oktay. Ils auraient appartenu au réseau Ergenekon, version locale actuelle du Gladio… c’est-à-dire des services secrets de l’OTAN. La symbolique de ces arrestations est renforcée par la campagne conduite depuis deux ans par les partisans de l’AKP dans les médias. A coup de fictions télévisées et de films de cinéma, ils ne cessent de vulgariser la manière dont les services secrets de l’OTAN organisèrent quatre coups d’Etat militaires successifs dans le pays. Ils ne cessent d’expliquer que les Anglo-Saxons jouent un double jeu, alliés de façade, ils ont alimenté les problèmes kurde, arménien et chypriote pour affaiblir le pays. A l’issue d’une longue et pénible réunion à huis clos, le secrétaire général de l’Alliance, Anders Fogh Rasmussen, a lu une déclaration d’une phrase : « J’exige la libération immédiate des civils ainsi que des navires retenus par Israël » . Bien sûr, personne n’a jamais envisagé que l’OTAN contraindrait Israël par la force, mais c’est bien là que se trouve le moyen de pression : pour préserver l’Alliance, les Etats-Unis devaient résoudre le conflit à l’amiable. 24 heures exactement après la déclaration de M. Rasmussen, le porte parole de l’administration pénitenciaire israélienne annonçait avoir libéré tous les prisonniers étrangers (il conserve en détention ses propres ressortissants impliqués) et être en cours de les acheminer vers leur Etat d’origine ou un Etat d’accueil. Ce rebondissement révèle un problème inattendu. L’Alliance atlantique, a été constituée par les Etats-Unis et le Royaume-Uni avec les Etats ressortissant de leur zone d’influence post-Yalta. Ils en étaient les maîtres et les autres membres étaient soumis à leur commandement. Hormis la parenthèse gaullienne, aucun membre n’a osé remettre en cause ce fonctionnement. Or, la Turquie, signe de sa montée en puissance, vient d’utiliser le Traité de l’Atlantique Nord pour forcer la main aux Etats-Unis. En menottant et en tabassant leurs prisonniers, les commandos israéliens hurlaient en riant « One minute ! », « One minute ! ». Ce gimmick fait référence à l’algarade ayant opposé le Premier ministre Recep Tayyip Erdoğan au président Shimon Peres, lors du forum économique de Davos. Cette provocation verbale a enflammé l’opinion publique turque qui s’estime insultée à travers son Premier ministre. Du coup, elle ne se contente pas d’approuver la réaction de M. Erdoğan, mais elle le pousse à en faire plus sur la scène internationale, ainsi que le montrent les derniers sondages. C’est pourquoi le Parlement turc a adopté une résolution très offensive qui enjoint le gouvernement de « reconsidérer [les] relations politiques, militaires et économiques avec Israël et [de] prendre les mesures efficaces appropriées » . Le ministère de la Justice a formé un groupe de travail pour examiner tous les recours juridiques en droit interne et international. Il s’appuie notamment sur le mémoire d’une association de juristes londoniens, que nous avons intégralement publié en anglais. . Le parquet d’Istanbul-Bakırköy a ouvert une enquête . Il a déjà fait procéder aux autopsies médico-légales et aux auditions des protagonistes turcs. Il pourrait inculper rapidement Benjamin Netanyahu et les généraux Ehud Barak et Gabi Ashkenasi pour piraterie, coups et blessures, meurtres, enlèvement et séquestration arbitraire. Cependant, selon les éléments rassemblés, le procureur pourrait requalifier les faits en crime contre l’humanité. Dans ce cas, les prévenus ne pourraient plus voyager librement sans risquer l’interpellation. Si l’on se réfère aux communiqués et points de presse de la Maison-Blanche relatifs aux conversations téléphoniques successives entre le président Obama et le Premier ministre Natanyahu, les Israéliens étaient initialement fiers de leur coup. M. Netanyahu appelle d’abord le président Obama pour s’excuser de ne pouvoir honorer son invitation compte tenu des évènements qui l’obligent à retourner d’urgence à Tel-Aviv. Lors de la seconde conversation, M. Netanyahu raconte sa version des faits, c’est-à-dire qu’il place le président Obama devant le fait accompli. Si les Etats-Unis avaient autorisé l’arraisonnement, ils ne s’attendaient pas à ce carnage. La troisième conversation porte sur la manière de torpiller la réunion du Conseil de sécurité, c’est-à-dire que les Israéliens dictent leur feuille de route aux Etats-uniens. La tonalité change lorsqu’on en arrive à la saisine du Conseil atlantique. M. Netanyahu devient difficile à joindre, tandis que la secrétaire d’Etat Hillary Clinton doit affronter son homologue turc, venu la harceler. Elle cherche un bouc émissaire et demande au général Ehud Barack de trouver une solution en faisant porter la responsabilité sur un subalterne, mais celui-ci refuse de faire sauter des fusibles. Non seulement il ne se désolidarise pas du commando qui a effectué le raid, mais il prend la défense de ses soldats et ira même leur rendre visite. En définitive, les Israéliens doivent libérer leurs prisonniers. Ils ont imposé la situation, mais se sont fait imposer le dénouement. Un problème supplémentaire surgit avec le décès de Furkan Doğan. Le jeune homme était double national turco-états-unien. Il s’ensuit que sa famille peut poursuivre l’Etat d’Israël pour meurtre devant les juridictions américaines. Au final, le gouvernement israélien a échoué sur ses deux objectifs. La Turquie sort renforcée de cet affrontement, et avec elle le triangle qu’elle forme avec ses alliés syrien et iranien. Au passage, elle a acquis plusieurs cartes. La Justice turque va juger par contumace les ministres et généraux israéliens pour les crimes commis. La mission d’investigation de la Commission des droits de l’homme va ternir un peu plus l’image d’Israël. Surtout, la Turquie peut jouer une seconde partie. Selon nos informations, Ankara a informé le département d’Etat que M. Erdoğan envisage de briser personnellement le blocus de Gaza, comme François Mitterrand brisa en son temps le siège de Sarajevo . Il pourrait embarquer sur une flotte humanitaire affrétée par des associations et politiquement soutenue par des gouvernements, dont l’Iran, la Syrie et le Venezuela. Hassan Nasrallah, le secrétaire général du Hezbollah, a déjà appelé tous les Libanais à participer à de nouvelles initiatives. Un appel pourrait être lancé aux marins de la Méditerranée, de sorte que des centaines de bâtiments de plaisance s’y joindraient. Le tout serait escorté par la marine de guerre turque… membre de l’OTAN. Cette perspective a effrayé Washington qui se trouve soudain une ardeur nouvelle pour convaincre Tel-Aviv de lever le blocus. Par ailleurs, le prestige acquis par la Turquie au cours de cette opération met en relief la collaboration de certains gouvernements arabes avec Israël, particulièrement celui d’Hosni Moubarak. Ce dernier a en effet activement collaboré au siège de Gaza afin d’empêcher le contact entre le Hamas palestinien et les Frères musulmans égyptiens. Le Caire n’a pas hésité à construire un mur d’acier avec l’argent des Etats-Unis et le savoir-faire de la France pour emmurer 1,5 million de Gazaouites . Et l’on se souvient de la réponse du ministre des Affaires étrangères Ali Aboul Gheit à qui l’on demandait ce qu’il ferait des femmes et des enfants affamés qui tentaient de passer la frontière. Il répliqua : « Qu’ils essayent, nous leur briserons les jambes ! ». Du coup, le sang des victimes du Marmara rejaillit sur le gouvernement Moubarak et Alexandrie est au bord du soulèvement. Pour lâcher un peu de lest, le gouvernement égyptien a donc décidé d’entrouvrir temporairement la frontière. Avant de jouer dans la cour des grands, la Turquie a probablement assuré ses arrières. Notre hypothèse, qui s’appuie sur l’interview de diplomates, est qu’elle a reçu des garanties de la Russie lors du voyage de Dmitry Medvedev au Proche-Orient. Ce scénario semble corroboré par la soudaine annonce de la venue à Ankara, le 8 juin, du Premier ministre Vladimir Poutine pour participer à un sommet auquel il n’était jusque là pas attendu. Il y rencontrera notamment le président iranien Mahmoud Ahmadinejad et le président syrien Bachar el-Assad (qui n’est pourtant pas membre de ce forum, mais vient soudain d’être invité en observateur). La délégation israélienne qui était inscrite renoncera probablement à venir : tout officiel de haut niveau serait à la merci du procureur d’Istanbul-Bakırköy. Celui-ci pourrait inopinément qualifier les faits de crimes contre l’humanité et faire arrêter les officiels. « Par la piraterie, Israël se dévoile aux yeux du monde », entretien de Silvia Cattori avec Hazem Jamjoum, Réseau Voltaire, 4 juin 2010. « Les preuves truquées d’Israël contre "Free Gaza" : des photos prises en 2006 et 2003 ? », par Aragorn, Agoravox, 3 juin 2010. « Pourquoi Israël a t-il attaqué des civils en Méditerranée ? », par Thierry Meyssan, Réseau Voltaire, 31 mai 2010. « Israël a t-il mené deux opérations militaires contre la Turquie ? », Réseau Voltaire, 2 juin 2010. « L’OTAN ne pouvait pas ne pas être au courant », par Manlio Dinucci, Réseau Voltaire, 2 juin 2010. « Message de Mouammar Kadhafi à Barack Obama », Réseau Voltaire, 2 juin 2010. « Déclaration du Président du Conseil de sécurité de l’ONU », Réseau Voltaire, 1er juin 2010. « Résolution du Conseil des Droits de l’homme des Nations unies », Réseau Voltaire, 2 juin 2010. « L’OTAN exige la libération de la Flottille de la liberté », Réseau Voltaire, 1er juin 2010. « Résolution du Parlement turc », Réseau Voltaire, 2 juin 2010. « The Attack on the Gaza Freedom Flotilla and International Law », par Lawyers for Palestinian Human Rights, Voltaire Network, 6 juin 2010. « Ouverture d’une enquête pénale à Istanbul contre les pirates israéliens », Réseau Voltaire, 5 juin 2010. Le 27 et 28 juin 1992, le président français, François Mitterrand franchit en hélicoptère la ligne de front et brise le siège de Sarajevo. 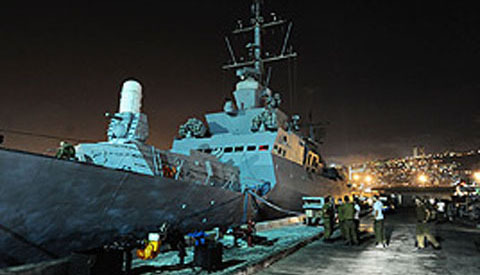 The military maritime piracy and massacre operation carried out by Shayetet 13, a naval commando unit, in which at least 20 peace activists were murdered and over 50 were wounded, Twas a decision of the inner circles of power in israel and approved by the Israeli Cabinet headed by Benjamin Netanyahu, Ehud Barak and other war criminals. his Israeli massacre was a message addressed to Turkey and its new Iranian and Syrian allies. Anyone who knows to read between the lines and the history of Israel’s military leaders can understand that Israel has never distinguished between civilians and militants of the groups which are considered as enemies according to the non-logical standards of the zionists. 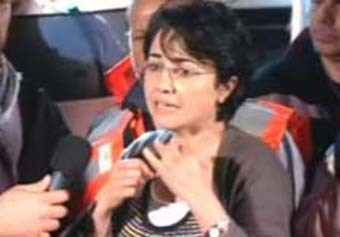 The Israeli Arab Knesset MP Haneen Al-Zaubi had spoken through a loudspeaker in Hebrew with the Israeli military telling them to not attack ships carrying civilian peace activists and humanitarian aid. She added that during her appeal the Israeli soldiers fired live bullets at ships, which led to the wounding of civilians. She added: “the Israeli gunboats approached the “Caravan of freedom” and asked the captain of the ship to identify himself and the identity of the boat. The ships were in the International waters about 100 miles from Gaza. At this moment the Israeli helicopters attacked the ships from the sky. Los líderes de la pandilla de criminales de guerra israelíes, llamado “gobierno israelí” está llevando a cabo la incitación y la planificación para lanzar una guerra nuclear contra Irán, no pudo hacer nada en respuesta al acuerdo turco-iraní-brasileño del pasado 17 de mayo de 2010 para la transferencia de 1.200 Kg de uranio de bajo enriquecimiento a Turquía a cambio de combustible nuclear. En represalia, perpetraron la masacre de la Flotilla de la Libertad con ayuda humanitaria con el objetivo de parar el genocidio de Israel contra Gaza impuesto desde 2006. El acuerdo turco-iraní-brasileño se presentó como un obstáculo frente a las ambiciones de Israel de forzar al mundo para entrar en una espiral sangrienta de una guerra nuclear. Es un error creer que el Gobierno turco no esperaba la masacre en contra de la Flotilla de la Libertad que llevaba 10,000 toneladas de ayuda humanitaria a Gaza. La piratería marítima militar y la masacre realizada por el Shayetet 13, una unidad de comandos naval, en la cual al menos 20 activistas de paz fueron asesinados y más de 50 fueron heridos, era una decisión de los círculos interiores del poder en Israel y se aprobó por el Gabinete israelí encabezado por Benjamin Netanyahu, Ehud Barak y otros criminales de guerra. Esta masacre israelí era un mensaje dirigido a Turquía y sus nuevos aliados iraníes y sirios. Alguien que sabe para leer entre líneas y la historia de los líderes militares de Israel puede entender que Israel nunca se ha distinguido entre civiles y militantes de grupos que se consideran como enemigos según los estándares no lógicos de los sionistas. Los barcos israelíes supervisaron la Flotilla Libertad desde una distancia de unos 124 km de la costa de Israel. De acuerdo con el movimiento internacional, los pasajeros se apresuraron a llevar chalecos de seguridad y levantó el estado de alerta tan pronto como los buques de guerra fueron visibles. Los activistas por la paz a bordo del convoy declararon que tres barcos israelíes hablaron con el capitán del buque turco por radio y le advirtió de las consecuencias de acercarse a la costa de Gaza, que fue declarada como área militar cerrada. Exigieron llevar la ayuda humanitaria al puerto de Ashdod, haciendo hincapié en que la armada israelí impediría la penetración de una zona militar cerrada a cualquier precio, lo que significa que no tendría ningún inconveniente en asesinar a alguien. Las barcos estaban llevando 10,000 toneladas de suministros médicos y materiales de construcción, madera, y 100 casas pre-construidas, para decenas de miles de personas que perdieron sus hogares debido a los crímenes de guerra de Israel contra Gaza a principios del año 2009. También llevaban 500 vehículos eléctricos para el uso de personas con discapacidad, sobre todo porque los crímenes de guerra israelíes recientes más de 600 quedaron permanentemente discapacitados, con las piernas amputadas. La árabe israelí del Knesset, Hanan Al-Zoubi había hablado a través de un altavoz en hebreo con los militares israelíes diciéndoles que no atacaran los buques que transportaban activistas civiles de paz y ayuda humanitaria. Agregó que durante su apelación a los soldados israelíes dispararon balas en vivo en los buques, lo que condujo que civiles fueran heridos, entre ellos el ciudadano árabe-israelí el jeque Raed Salah, quien fue baleado y ahora está en estado crítico. Y agregó: “las cañoneras israelíes se acercaron a la” Caravana de la libertad “y pidió al capitán del buque que se identificara y la identidad del barco. Los barcos se encontraban en aguas internacionales a unos 100 kilómetros de Gaza. En ese momento los helicópteros israelíes atacaron las naves desde el cielo. Fuentes turcas y medios de comunicación revelaron un documento que acreditaba que una lista de muertos había sido preparada de antemano por los israelíes, mostrando los nombres y fotos de personas a bordo de los buques para ser asesinados, que, según Israel, ” participan en la ayuda humanitaria internacional para Gaza”. Según fuentes turcas, cientos de soldados israelíes irrumpieron en el barco turco azul “Marmara” y tenían copias de la lista de la muerte. La lista incluía los nombres de los civiles que debían matar “. El documento fue recuperado al parecer después de que uno de los soldados israelíes lo perdiera durante el acto de piratería. En cuanto a la complicidad de otros Estados extranjeros en este crimen, ha trascendido que los parlamentarios alemanes que estaban a bordo, Annette Groth, Höger Inge y N Orman Paech, había pedido reiteradamente al Ministerio alemán de Relaciones Exteriores apoyo y protección, pero fueron rechazados y en cambio, se les advirtió no bajar de la flotilla sin especificar el “peligro”. La extraña actitud de Chipre, que no permitió a los barcos entrar en el puerto, y no se permitió que una delegación de parlamentarios subiera a bordo de los barcos, en retrospectiva puede explicarse sólo con el conocimiento previo y la complicidad en el delito, del régimen chipriota. Al final, Israel ha llevado a cabo una sangrienta y horrible masacre , siendo todas las víctimas civiles. Las preguntas permanecen: ¿Conseguirá Israel sus objetivos con la masacre de la “Flotilla de la libertad”? ¿Turquía y los demás países habrán recibido algún mensaje de Israel? ¿Cuál fue el mensaje de Israel? La respuesta a la primera cuestión es un claro ahora, y los próximos días revelará la respuesta a la segunda cuestión y si realmente Israel considera a Turquía un enemigo en secreto. Sea cual sea la respuesta a estas preguntas, Israel debe reconocer que la ecuación política ha cambiado en la región e Israel y sus aliados ya no puede cambiar la política. En el mejor interés de todos, Israel debe comprender que todo lo que hacen está en contra de ellos y que sería mejor que se abstenga de realizar nuevos actos criminales. Asimismo, en el mejor interés de todos, todas las demás naciones deben entender que Israel ya no tiene legitimidad alguna como estado, y que su existencia como un estado no es deseable en el extremo a cada uno fuera de las élites corruptas diminutas que son su base de apoyo en el extranjero. What do chocolate, cookies, A4 paper, potato chips, cumin, toys, jelly, nuts, dried fruit, nutmeg, and goats have in common? It's a tricky one. If you're a moderate, they have nothing in common. But if you are a hard-line Israeli politician, they are all potentially dangerous goods that could threaten Israel's security. It seems that side of the political spectrum has won the argument, as all the above are items that the Israeli government has prohibited from entering Gaza. It's understandable. I mean, you can inflict a lot of damage on your oppressors with a chocolate biscuit. And those paper cuts, boy, they can really hurt. But I don't want to over-dramatize the situation, because it's not all doom and gloom down in Gaza. Many items are allowed in: mops, sponges for washing, egg cartons, glass cleaner, hair combs, plastic chicken cages, and lentils, for example. So what exactly are the 1.5 million Gazan people complaining about? What could possibly have been on the Freedom Flotilla that Israeli commandos attacked early last Sunday morning in international waters, in yet another assault that has appalled our global community? By most accounts, on the flotilla were 10,000 tonnes of, not guns, but vital humanitarian aid. The people of Gaza desperately need it to survive the 1,000 days of illegal blockade which has crippled Gaza and reduced it to a barely functioning, open-air prison. This is aid like cement to rebuild homes, which have lain in rubble and ruin since the monstrous attacks on Gaza last year; school supplies; and medical equipment, like water purification tablets and wheelchairs. It is a doctrine that lives for itself and off others. It survives by tapping into the subliminal and cognisant levels. It implants into public consciousness a set of tenets that see Israeli's very existence as eternally under threat, to be defended through any means (preferably through use of force to show the enemy who's boss). It is best served through the adoption of an "us against the world" mentality. By its very nature, hardline ideology is self-serving and self-perpetuating. Its primary goal is to survive – and that precludes everything. If to exist it must redefine what is acceptable, redraw the lines of international law, and re-imagine what weapons are appropriate – so be it. Assigning themselves authority and immunity, Israel's leaders feel licensed to do whatever they like and not expect an international outcry. The effect is a people trapped between a rock and a hardline policy. The product is desperation; the reaction, more hardline policies, attempting to defend previous hardline policies. After all, did this outrageous attack take place to preserve Israel's security, or to sustain the blockade itself? What is most frustrating is Israel's defence of its actions. By attacking criticism as part of an anti-Israel, anti-Semitic propaganda war, Israel, yet again, fails to understand that the problem is policy, not PR. Now and always, hardline policy and those who embrace it are vessels for darker forces that are at once self-cannibalising and combustible. No good can come of them. They are unsustainable because their sense of righteousness denies human worth. Apart from other hardliners on all sides who now have been gifted the fuel to invigorate their fanaticism and circulate it far and wide, everyone else loses out. The people of Gaza lose out: 80 per cent of them live below the poverty line. The children of Gaza lose out: one third of their schools, destroyed during the attack on Gaza last year, still haven't been rebuilt. The newborns of Gaza lose out: 95% of Gaza's nitrate-full water fails the World Health Organization's standards, leaving thousands of babies at risk of poisoning. The people of Israel lose out: rejected by a third of the countries in the United Nations, shunned by much of the global community, ordinary Israelis find themselves persona non grata outside their "borders". Living defensively isn't a way of life; people only thrive on secure foundations. Is the Israeli government really prepared to condemn its own people to the shaky foundations of rule-by-fear, and its consequences? Israel's leadership needs to ask itself some tough questions. "Is our long term strategy to rule by fear? Is our long term outlook for the Israeli people one of constant defence? Are these horizons of hopelessness what we want for our people?". And moderates around the world lose out: people like me, who dared to believe that the road to peace doesn't have to be a lonely and desolate one. That a two-state solution is not the figment of a naïve idealist's imagination. And those whose ethical responsibility it is now to deal with the science of reality, to form a coalition of humans that question and confront the assumptions of those on their far right, and to reaffirm the ethos of moderation. After all, isn't moderation where most of the living is done? Speaking as a moderate, I fear if the tides don't turn in our region, moderation will be amongst the most painful casualties of continued aggression and hardline policies. As someone who lived through the late King Hussein's fight for peace, until his very last breath, and watches his son, my husband, King Abdullah, continue that fight, it actually breaks my heart to see us moving further and further away from peace. (June 8) -- President Barack Obama says White House newswoman Helen Thomas made the right decision to retire after she created an uproar by saying that Jews should "get the hell out of Palestine." "The comments were offensive. It's a shame because Helen was somebody who had been a correspondent through I don't know how many presidents, was a real institution in Washington," Obama told Matt Lauer in an interview that aired this morning on NBC's "Today" show. "But I think she made the right decision. I think that those comments were out of line, and hopefully she recognizes that. " On Monday, Hearst Newspapers announced Thomas' immediate retirement. "Her decision came after her controversial comments about Israel and the Palestinians were captured on videotape and widely disseminated on the Internet," Hearst said in a statement. It noted that her 90th birthday is Aug. 4. Thomas began her career as a correspondent with United Press International in 1943. According to her website, she has covered the administrations of 10 U.S. presidents, starting with the Kennedy administration. She was the first female member of the White House Correspondents' Association and the Gridiron Club. At the conclusion of presidential news conferences, it was her voice that announced, "Thank you, Mr. President." In 2000, she left UPI and joined Hearst News Service as a columnist, but was still honored with a front-row seat at presidential news conferences. The board of the White House Correspondents' Association said the incident revived the question of whether it is appropriate for an opinion columnist to occupy a prominent seat in the White House briefing room. The board will hold a special meeting Thursday to decide on the matter. "Helen Thomas' comments were indefensible, and the White House Correspondents' Association board firmly dissociates itself from them," the board said in a statement. "Many in our profession who have known Helen for years were saddened by the comments, which were especially unfortunate in light of her role as a trailblazer on the White House beat." During a White House commemoration of Jewish Heritage Month on May 27, Rabbi David F. Nesenoff of the website RabbiLive asked Thomas if she had any comments on Israel. "Tell them to get the hell out of Palestine," said Thomas, who is of Lebanese descent. "Remember, these people are occupied. And it's their land. It's not German, it's not Poland." When Nesenoff asked Thomas where the Israelis should go, she said they should "go home" to Germany, Poland and the U.S.
Video of the gaffe has been widely circulated on the Internet. Thomas apologized on her website on June 4, saying, "I deeply regret my comments I made last week regarding the Israelis and the Palestinians. They do not reflect my heartfelt belief that peace will come to the Middle East only when all parties recognize the need for mutual respect and tolerance. May that day come soon." But Abraham Foxman, national director of the Anti-Defamation League, demanded a "more sincere" apology. 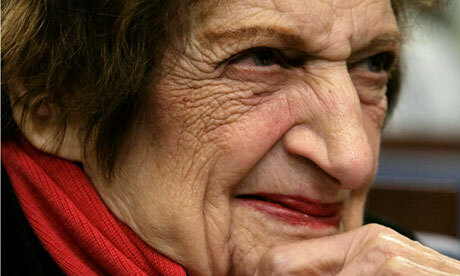 "Helen Thomas' statement of regret does not go far enough," he said in a statement. "Thomas needs to make a more forceful and sincere apology for the pain her remarks have caused." Longtime Washington journalist Helen Thomas abruptly retired Monday as a columnist for Hearst News Service following remarks she made about Israel that were denounced by the White House and her press corps colleagues. Thomas began her long career with the wire service United Press International in 1943, and started covering the White House in 1960, according to a biography posted on her website. She became a columnist for Hearst in 2000.